On the 26th of November 2015, Mobilink and Warid announced that they would merge in to one, making this one of the largest Merger and Acquisition (M&A) deals to take place in Pakistan. Mobilinkers high fived each other on what appeared to be a clear win: after years of rumors and months of extensive negotiations, Warid had finally been acquired and was ready for assimilation in to the Mobilink way of doing things. Unfortunately, things are never this simple, especially in deals of the magnitude we are looking at here. It would be naïve to imagine that the finish line has been reached. In fact, it can be argued that the real test for Mobilink, its management, and most importantly its employees will start from this point onwards. It is also important to appreciate the implications this deal will have on the overall Pakistani telecom industry. We are sure that you all have heard that Mobilink did this merger for a ‘bigger market share’. This deceptively simple answer needs to be dug in to a little more to understand why Mobilink, or any other operator for that matter, would really want to take up the hassle of entering in to an M&A (merger and acquisition) deal? Was is it simply emotive i.e. the need to be number 1 in a shrinking market just to cater to the egos of top level managers? While this might be true to some extent, it is never the overriding reason. Mobile phone companies all over the world are largely similar in their operations, with the same vendors catering to all the operators with core services that are highly standardized. A combination of high fixed costs/low variable costs have resulted in the global telecoms industry being geared towards a generic competitive strategy called ‘cost leadership’. The lack of any meaningful product differentiation means that operators cannot charge a premium versus the competition and have to be highly focused on lowering their costs (and not necessarily prices) to remain profitable. Here is a highly simplified example: If a telecom tower costs a total of $10,000 and can cater to 5,000 customers, an operator that can get 5,000 customers fastest would have the lowest cost per customer and will be hence will be more profitable. Hypothetically, if Mobilink has 5,000 customers on a tower its cost per customer would be $2 ($10K/5K customers), while Ufone with 2,000 customers would be at $5 ($10K/2K customers). Mobilink would hence have higher percentage profits if the ARPUs for both operators were at a similar level. Do note that cost leadership strategy is different from price leadership, where an operator decides to keeps a low price to be competitive irrespective of its cost structure i.e. it simply chooses to make less profit in order to have market share. At least 4 of the 5 operators in Pakistan are geared towards a cost leadership strategy and hence the race for market share is essential for their survival as the one with the biggest market share would have the lowest cost per customer. Mobilink’s acquisition of Warid makes perfect strategic sense, provided that Mobilink’s long term view is to continue to remain within the confines of the telecom market. It is no secret that globally in around 95% of all M&A deals, it is the seller that benefits the most, and not the buyer. While we are not privy to the exact price tag of the valuation of Warid or Mobilink here, the deal appears to be a stock swap with a 4-year restriction scheme. Also Read: Everything You Need to Know about Mobilink-Warid Merger! At the end of 4 years, the Abu Dhabi group can exit at ‘fair market price’. The fact that no cash was involved as well as delayed exit (of four years) shows that the Abu Dhabi group was eager to get this deal out of the door and reflects on the long term prospects of Warid’s operations. This combined with the ticking clock for a refresher of an expensive GSM license (for Warid) in 2019 could mean pressures to sell quickly. So given the apparent eagerness of the Abu Dhabi group to sell, has Mobilink management actually beaten global odds and gotten a great deal at a great price? The answer again is not straightforward. Firstly, let us do some back of the envelope calculations of the value of the deal. Most telecom M&A deals in developed markets are priced at 1.2x of total revenues of a company, while in emerging markets the ratio is 3.7x to account for the higher growth prospects. Given the slowdown in growth in the past few years of the Pakistani telecoms market, we could argue that the multiplier should be that of developed markets. Assuming a 1.7x multiplier (similar to peer firms have in Asian markets) on a 15% shareholding of a $1.4 Billion revenue company (combined revenues for last 12 months till Sep 2015 of merged company) makes the estimated equity value of Warid at $357 Million. That looks like a really good deal for the Abu Dhabi group, which was also carrying Warid’s debt of $470 Million. Mobilink on the other hand makes up most of its value of this deal from a tricky beast called ‘synergies’. The argument is that the two companies combining their operations can produce more profits than the two working separately. In other words, 1+1 = 3. There are two types of synergies…Cost and Revenues. Cost synergies are quite straightforward as they involve less uncertainty. Using the previous example, if Mobilink and Warid have two towers in the same coverage area, Mobilink should shut down the Warid tower and transfer all of its customers to its own tower. This should drive down the costs per customer for Mobilink dramatically hence making it more profitable. Revenue synergies, however, are far more unpredictable and the wise tend to avoid building them in to valuations. A simplified example here would be that Mobilink would get more customers because of joint branding in an ad with Warid (already sounds unrealistic!). The said synergies are being held at $500 Million mark (in net present value which basically means it is both risk and time length adjusted). Given that Warid’s license is going to expire in 2019, not a lot of it can be attributed to a ‘saving’ on purchasing a 4G LTE license separately, something that cost Zong $210 Million. So for the sake of simplicity, let us assume that there are no revenue synergies, and given the short duration of Warid’s license, the LTE spectrum saving for Mobilink is a generous $100 Million. That leaves behind $400 Million worth of synergies that cannot be realized by simply asking vendors for a larger discount on purchases of telecom equipment. This will be driven down aggressively by reducing costs on the capex and opex side (redundant towers, NOCs etc. would be shut down), reducing distribution channels (number of franchises would be reduced at a lower percentage margin due to higher market power of the combined entity), reduced marketing spend (one brand should be enough in the long run) and last but definitely not the least laying off redundant staff from both organizations. The stock market reaction to this deal has been at best mixed. The London Stock Exchange reacted positively to the news, raising the share price of Global Telecom (the parent organization of Mobilink) by +3.85% upon the release of the news. On the other hand, US based NASDAQ seems to have penalized the Vimplecom for this deal. The stock price of Vimpelcom went down by -5% on opening day and continued to stay there. Given that Vimpelcom’s market cap is nearly 6x of that of Global Telecom’s, the net result of this share price movement has been negative on shareholders. Having said that, a single day’s trading is too early to speculate on the market’s belief that Mobilink would be able to realize its target synergies (and hence paid the right price for Warid) and we should keep an eye out for stock price movements of at least 30 days before coming to a definite conclusion. Post-merger integration (PMI) is key to successfully realizing value from this merger and is possibly the hardest part of this deal. Given the size of the deal and that, it is a first of its kind transaction in the industry, there will be a significant learning curve for both firms to make the PMI successful. The more technical bits are the integration of IT systems and network components which are likely to be relatively straightforward given the overlap of common vendors such as Ericsson on both sides. The human resources aspect will be tricky and this is where the two organizations would face a shuffle. It might be convenient to imagine that Mobilink would keep its entire work force and Warid would not but that is likely to not hold true. There will be Warid specific parts of the business that would need innate knowledge that only a Warid employee would have. At the end of the day, it would hurt the deal the most if the remainder Warid employees were in consistent fear of their jobs. To make this work, Mobilink would have to heavily and consistently incentivize key team members down to middle management in both organizations to drive integration forward over several years. This will definitely be time consuming and expensive, and will take longer than the target set for 6 months. This deal will indeed have a long-standing impact on the Pakistani telecom industry and will trigger a directional change in the years to follow. Regardless of whether or not Mobilink is able to fully realize the expected synergies, it will gain significant market power over time allowing it to be more aggressive within the industry. For instance, the greater scale will make it more feasible for Mobilink to adopt a price leadership strategy in pursuit of gaining subscriber market share, hence directly affecting Ufone and Zong. This shift in ‘balance’ could create immediate term externalities that will affect how competitor shareholders are likely to respond. In shrinking industries that are on the cusp of consolidation, it is usually the first deal that ends up triggering a tidal wave of M&A activity across the industry. In such a scenario, there is a chance that future acquirers pay-out excessive deal premiums versus fair market price and that can lead to value destruction for both themselves and the industry as a whole. Regardless, in any consolidation scenario, it is the workforce/employee base within the industry that suffers the most with an inevitable shift in supply and demand of jobs. While how consolidation takes place is important, we think that this is not the biggest strategic question facing Mobilink and its peers in the coming days (or at least should not be). For us the bigger question is whether intra industry consolidation is the best step forward for the Pakistani telecom industry? What implications will it have on plans of digitalisation and ambitions of trailblazing the information economy that most operators boast of? Will consolidation really solve the core strategic problem of shrinkage that the global telecom industry as a whole is facing? Let us look at this from Mobilink’s perspective. While Mobilink may have created a significant competitive advantage for itself within the telecom industry, given the size of the acquisition, one can argue that perhaps it has limited its strategic options outside of it. Questions that come to mind are: Can Mobilink truly focus on building ‘real’ internet age capabilities like e-commerce, internet enabled services, cloud based services etc. given its entire management’s focus would be on post-merger integration with Warid for at least the next 24 months? If not, will its shareholders have the risk appetite to do another round of M&A to buy the said internet age capabilities post the Warid deal? These questions are even more important for the remaining telecom players as their strategic scope is not quite sealed as yet. Instead of further consolidation, other operators can consider expanding the scope of their business portfolio beyond the mobile operator space. The emergence and exponential growth of internet-enabled businesses in the absence of institutional investors is possibly an area that can and should be explored. Perhaps an acquisition of an up and coming e-commerce business or an internet marketplace would be a better strategic option for the likes of Telenor, Ufone & Zong than for them to target each other for acquisition. We do admit that such an option poses its own set of risks, the biggest one of which is their possible inability to parent such inherently different businesses. Interesting times and choices ahead! Both Hamza and Sajjad used to work in the Pakistani telecoms industry prior to working in the strategy team of the largest independent video games publishing company in the UK called Jagex. Hamza has an MBA from the University of Cambridge, while Sajjad has an MSc in Marketing and Operations Research from Stanford University. Both hold further specialization in M&A and Corporate Strategy from INSEAD. The deal couldnt have been explained any better than this… thumbs up!!!! Lenghtly and over explained, I gave up after second part. Anyway hopefully it won’t affect the call quality of warid’s existing customers which is best as compared to other networks. Only an M.B.A or M.Com can understand this brilliantly and detailed written article. I am sure that you mean “Axactly” as MBA and other degree holders can relate more to Axact than some other misspelt word. Very well written, covered every aspect of the market challenges ahead and line of action for competitors. It has now become necessary for Telenor to get 4g license asap as Mobilink will get 4g license of Warid. What do you mean? Telenor and Ufone can get 4G without additional license? Now please also explain Physiology and Biochemistry too. Telecom sector must move forward in Mobile Paisa like services. Every ATM/CREDIT CARD must be Mobile Paisa as well along with VISA or MASTER. Make Pakistan cash free. Mobile money market is a separate domain. easy paisa, mobicash are already working on it on a fast pace. Actually we did cover that in the synergies section. We valued the spectrum aspect at $100 Million as Warid’s license expires in 2019 and will need to be reinvested back in order to keep the spectrum. actually, 5 MHz from 8.8 MHz 1800 MHz band was refarmed for LTE. Also note that when the 2 networks combine, many cell sites will be redundant and lot of spectrum will get free. Mobilink can then refarm their own 900 & 1800 & warid’s 900 & 1800 spectrum for LTE. Ultimately you will have to shift 2G voice to 3G to make way for 4G LTE. Thats the future. Very well written. Extremely incisive. 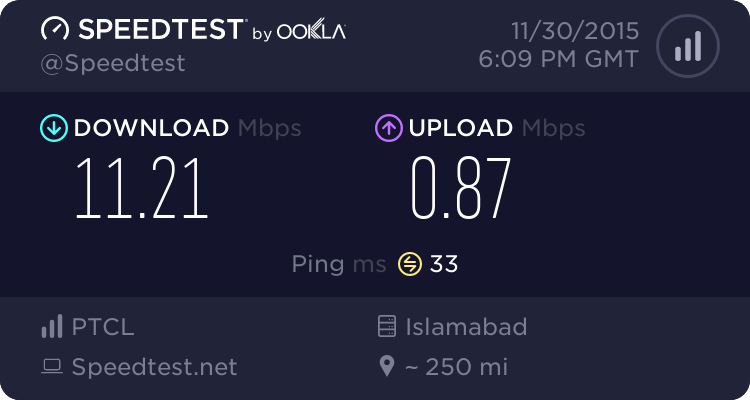 i AM ALSO GETTING SAME SPEEDS IN GUJRANWALA . I just don’t understand the speed craze on capped internets. 3G/4G is extremely expensive, if you really want a fast connection then get a wired connection which is also unlimited. I use 3G for facebook and browsing, not for downloading. For downloading i have my ptcl unlimited 12Mb. Well researched analysis. They have not written anything regarding future competition between Russia, China and Europe in Pakistan. Really nice analysis. As a business student, i would say PMI is the reason for most of faliures (that does not mean closing down of the business but a hard road for next 3 to 5 years), its always a wait n watch game and i tend to fall on US mrkt’s reaction as compared to UK. Having said that… All in all really a good read. And I was thinking one the authors must be a Chartered Accountant. Having done my ACCA, I was searching for all these financials and non-financials very well and comprehensively explained. A value created article. The thing is that one can do analysis on anything generally but going to the root causes and indepth analyzing pre & post merger situations is the art of very few people which is perfectly done here. Some of the concepts are oversimplified. Merger of Cellular operators differ from merger of two barber shops. for e.g: If Mobilink and Warid have overlapping coverage, the article suggests to remove either of the site. This is crazy idea…. The Traffic team will do traffic analysis first, & initially Handover between the two sites will be allowed. Simply allowing Handovers between operators of two sites involves complex engineering. The merger will initially add more jobs in telecom sector. However, in the long run; jobs will reduce. But PTA may auction one more license. In my opinion, the deal should had been blocked by CCP. Mobilink, Telenor and now Warid are all Vimpelcom one way or the other. This merger is absolute counter competitive and this merger will make Vimpelcom oligopolize the market by holding more than 70% of subscribers. The fact is, Vimplecom has no stakes in Telenor. In fact, Telenor Group has shares in Vimplecom (33%) which it has decided to sell a month or two back. It is common knowledge that Warid is facing management level issues since last 3/4 years. And because of that it has lost customers over the years, despite having the best user experience. The way I see it, one of the major players, with LTE license and deployments, was slowly going out of the market. And this merger can save Warid and be favorable for the telecom sector. As you see, CCP did consider Telenor stakes in Vimpelcom while vetting the merger case. Authors nailed it. Really enjoyed reading it. Is data sims are being issued separately? i.e. without being included in 5 sims space as supreme court issued notice like a month ago that a person can buy 3 data sims in additional to default voice sims? After biometric system, there is no point of 5 SIMs limit by the way. Govt. is pushing it too hard for the telcos. is there any update of 3g/4g services for ajk n gb? anyone??? both networks are good ! what is the share price of this transaction?